＊Commodity description and story * Daisy florid: eternal happiness. The legendary forest sprite is the embodiment of Daisy, she is a playful imp. Daisy also represents a happy, happy, pure, innocent, peace and hope. Each glass ball containing four small purple daisies . 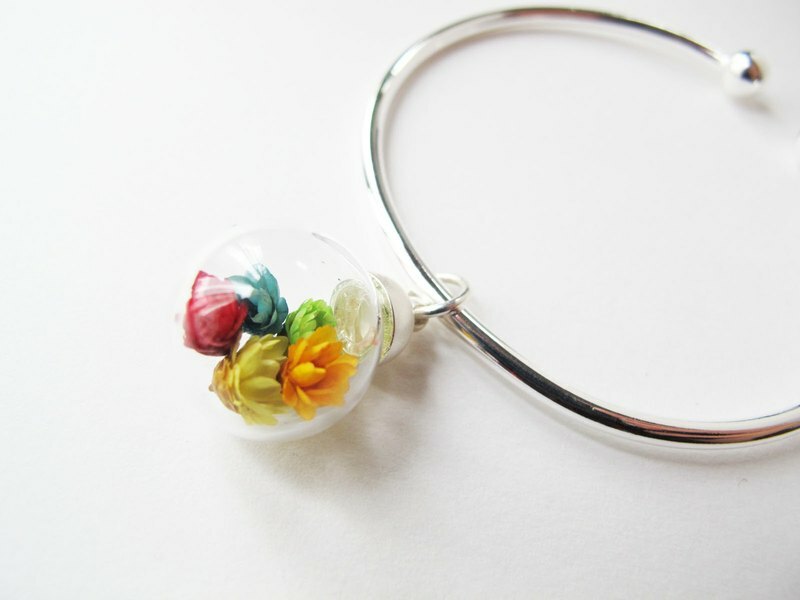 ＊Size＊ Glass ball diameter: 1.6cm Bracelet Size: 17 cm (adjustable.) ＊Material＊ Dandelion seeds,Glass ball,sterling silver bangle. ＊Care Instructions＊ ♥ Avoid contact with water when wearing this product. If the product gets wet, dry it immediately. ♥ Avoid direct contact with perfumes or cosmetics. ♥ When not wearing, put the necklace in a plastic zipper bag, and store it in a dry and dark place. ＊Post＊ In order to make the mind, the goods can safely into the hands of the guests. Our one to use registered mail which content a tracking number. Can greatly reduce the risk of missing goods.